Video's gone green- pot adjustment? So a lil' while back, I picked up Beef Drop for my 7800 (thus completeing my goal of having a release of Burgertime for every possible pre- NES console I own). While it played fine, I immediately noticed the color was quite off- far too green. Ballblazer had the same issue. The internet tells me this isn't uncommon on 7800s and I just need to adjust the color pot. However, I'm not that kind of technical- I don't know what a color pot is, and no one seems to have pictures/video explaining just what I'd need to do! So, two questions: 1) what is a color pot and how do I adjust it, and 2) Should I? Or is this not something an amateur should be handling? I mean, I've considered an AV mod in the past, so if this is best fixed by someone in the know, perhaps sending it somewhere for a refurb & a video mod is best. 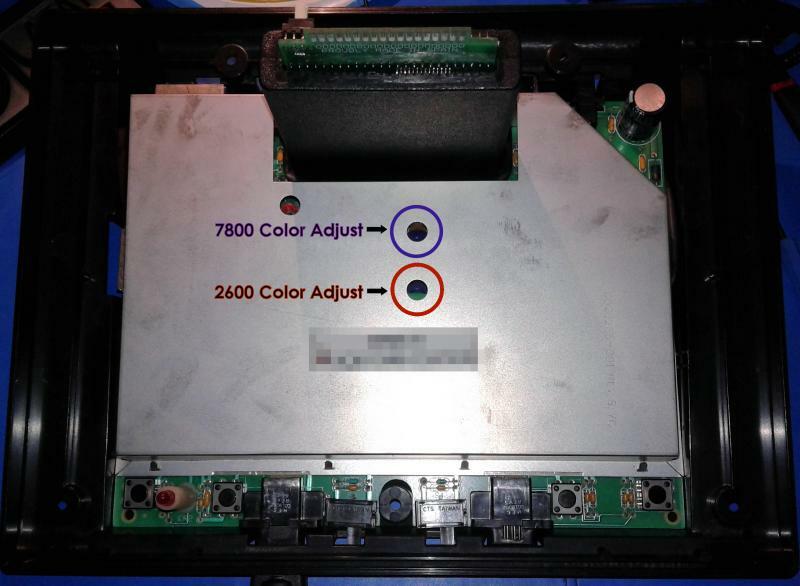 It is quite easy to adjust the color and Atari designed the 7800 so it could be done without having to remove the internal RF shielding. You still have to remove the top case cover but thats it. Once the cover is removed, you will see two holes one above the other just off center right below the cartridge port area. That is where the color adjust trimmer pots are located. The top one is for the 7800 colors along. The bottom one is for the 2600 colors. It is best to do these adjustments with a nice CRT like a PVM and with the Color Bar generator program for the 2600 and TEP's 7800 Utility program for the 7800. An AV mod won't correct the colors on its own unless the person doing the mod work knows to adjust the colors trimmers at the time of install as well. I can shoot you a picture later if you still need to see what I'm talking about. But basically just use a small #1 flat bladed screwdriver to adjust the color left and right until it is where you like it. Make sure to insert the screwdriver into the console and make sure it is seated in the trimmer pot first before you turn it on. Ideally, you use a plastic adjustment tool for something like this, but the trimmers have glyptal on them from the factory so they don't always turn easy enough for a plastic adjustment tool. Random thought: assuming I can't get a good plastic tool, do you think sticking a water balloon over the screwdriver would be a good way to keep myself from getting fried making a mistake? or am I overthinking this? Edited by HoshiChiri, Tue Apr 16, 2019 6:09 PM. You won't get fried. There is only +5 running throughout the 7800. Near the power port is where you have your +11 - 14v unregulated but you won't be anywhere near that. And I use a small pocket flat bladed screwdriver to make these adjustments on the ones I service. Edited by -^Cro§Bow^-, Tue Apr 16, 2019 6:37 PM. Thanks for the info! I'll have to pop it open on my next day off & see what I can do!